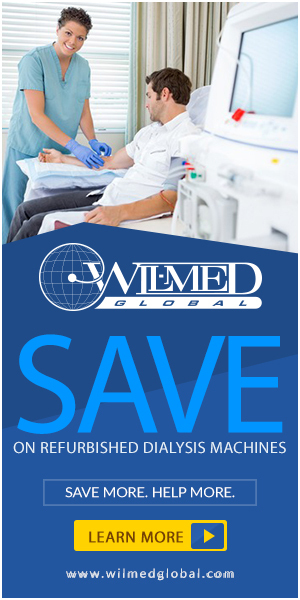 Here at Wil-Med Global, Inc., we realize the decision to purchase dialysis equipment from one vendor or another can have an enormous impact on your company’s ability to provide quality patient care. Since there are many various options to consider, our goal is to take the anxiety out of buying dialysis equipment. Our belief is that a customer should have peace of mind when they make a large capital investment that is crucial to their patients’ well being. This is why buying your equipment from Wil-Med Global, Inc. is such a smart decision. Why put your confidence in Wil-Med Global, Inc.? We provide our clients with sound, reliable, and problem-free equipment that looks and run like new. Our history of quality, and experience prove our reconditioning process is second to none. Wil-Med employs only Factory Certified Technicians and use only OEM Parts in our reconditioning process. Each reconditioned machine is shipped with its own documentation including a work order. The work order details all work that has been performed on each machine during its reconditioning process. Wil-Med Global, Inc. is proud to have a parts account with every major dialysis equipment manufacturer and only use original equipment manufacture parts. Our technical staff with 25 years of experience is always available to assist with any questions. Remaining the highest quality provider of reconditioned dialysis equipment in the world requires continued innovation and attention to detail. A big advantage is having a direct link to the best equipment, the pool of dialysis machines available through Wil-Med Global, Inc. is, in a word, enormous. We are a preferred vendor with major dialysis management groups coast to coast. To put it simply, better connections mean a better source and quality of pre-owned equipment to start the reconditioning process. The end result, machines that exceed expectations of performance and appearance, at a fraction the cost of new. Wil-Med Global Inc. has been providing equipment to many of the largest renal care providers in the world for over 22 years. We have the largest network of suppliers in the market; and you won’t find a longer warranty on reconditioned equipment anywhere else. Add our 24-hour technical assistance, and Award Winning customer service and you will see that equipment from Wil-Med Global is not only a smart decision for your patients, but for your peace of mind as well. The Wil-Med Global team would like to present you with options we have available regarding your Dialysis Equipment needs. Our goal is to provide quality reconditioned dialysis machines that will exceed expectations of performance and appearance, at a fraction the cost of new. In 2003, the Wil-Med Global purchased and moved into a new state-of-the-art reconditioning facility in Broken Arrow, a suburb of Tulsa, Oklahoma. This building was specially designed to maximize quality in the original equipment manufacture standard reconditioning process. We currently have an enormous selection of machines in stock ready to be fully reconditioned. To ensure fresh machines are shipped we start and finish the process after we have received the order. When complete, each machine is bubble wrapped and delivered directly to your facility by our nationally recognized and insured electronic equipment-shipping specialist. Furthermore, we are so confident of our quality, a detailed work order and warranty is accompanied with each completed machine. Our reconditioning process starts by refinishing the cabinet. We strip the machine down to the shell, then prime, seal, and re-paint the cabinet. Once the machine is reassembled, we perform an extensive reconditioning and Preventative Maintenance service. During the final calibration process we test the mechanics, hydraulics, and the electrical systems of the machine. When finished our clients have a machine that is cosmetically and mechanically like new. Each machine is tested and disinfected prior to shipping. The machines come with new jugs, pickup wands, kidney clamps, manuals, PLUS a 1-year parts warranty minimum. Wil-Med is a full-service Dialysis Equipment provider. We offer technical assistance, setup (with large orders), and parts. After purchasing equipment, our customers can purchase parts at our Domestic List Price and even below. We believe the patients and staff deserve the best and Wil-Med Global strives to provide superior quality, value, service and selection. We have set the standard of quality for reconditioned dialysis equipment worldwide and are ready to serve our customers. Thanking you in advance for considering Wil-Med Global.